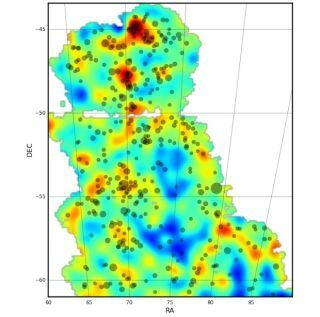 A detailed map of dark-matter distribution across a large swath of the universe. BALTIMORE — In the universe, dark and light tend to cluster together, according to new maps that chart the location of dark matter over a large portion of the sky. The new maps show that in some places there are large amounts of dark matter, while in others it is almost entirely absent. The researchers who made the maps also looked at the location of regular matter — huge clusters of galaxies — and show that the two appear to be linked: the galaxy clusters tend to lie close to where the dark matter lies. Astronomers know more about what dark matter is not than what it actually is. See what scientists know about dark matter in this Space.com infographic. The universe contains roughly five times more dark matter than regular matter, and the gargantuan gravitational force created by all that dark matter influences how galaxies form and evolve. Other studies have looked at how dark matter and regular matter are aligned in the universe, but these tend to focus on small areas of the sky. The new maps are some of the highest resolution maps of this kind over such a large area (150 degrees square on the sky), the authors of the new analysis say. The influence of dark matter on the evolution of regular matter is a topic of intense study by cosmologists. The new maps provide more evidence that even though these two types of matter are fundamentally different, dark matter has a strong pull on regular matter and influences how it is distributed throughout the universe. "Zooming into the maps, we have measured how dark matter envelops galaxies of different types, and how together they evolve over cosmic time," said Chihway Chang of the Swiss Federal Institute of Technology (ETH) in Zurich, and a lead author on the new analysis. "We are eager to use the new data coming in to make much stricter tests of theoretical models." The data for the maps was taken using the 750 megapixel Dark Energy Camera — one of the highest-resolution cameras ever built, the APS statement said. The camera is mounted on the 4-meter (13 feet) Victor M. Blanco telescope at the National Optical Astronomy Observatory's Cerro Tololo Inter-American Observatory in Chile. The primary goal of the Dark Energy Survey (DES) is to understand the mysterious phenomenon causing the universe to expand faster and faster. Dark energy and dark matter are two distinct phenomenon, but scientists with DES said in a press conference at the APS meeting that learning about dark energy requires watching how it has changed the formation of structure in the universe. On a cosmic scale, structure refers to the overall distribution of dark matter and regular matter. Dark matter remained invisible to scientists for many centuries because it does not radiate, reflect or block light. But the massive gravitational force of dark energy eventually gave it away; its presence greatly influences the motion of regular matter, like galaxies and galaxy clusters, in the universe. The scientists using the Dark Energy Camera made their maps using another effect of dark matter's strong gravitational pull called gravitational lensing. Looking out at the universe, if a distant galaxy lies behind a very massive object like a patch of dark matter, the light from the galaxy can be warped slightly by the gravity. This warping of light by an otherwise invisible source of gravity is what scientists using the Dark Energy Camera look for to locate dark matter. "We measured the barely perceptible distortions in the shapes of about 2 million galaxies to construct these new maps," said Vinu Vikram, a fellow at Argonne National Laboratory (then at the University of Pennsylvania) and a leader on the analysis. The analysis will be posted to the website arxiv.org today (April 14).